Proper designing of duct in a commercial HVAC system is very important in order to get the better performance. Designing an air conditioning duct system is crucial while installing HVAC system in the enclosure. An improper design of HVAC system may not give that satisfaction of the comfort level as well as it may lead to a negative impact on your energy bill. 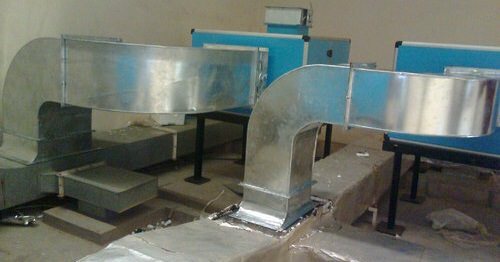 Several parameters are considered while designing the HVAC duct system for air conditioning, such as the rate of airflow, energy load, proper positioning etc. Keeping in mind that the fans are fixed, the ducts are really used as a movable (or fixed in some cases) ventilator. Numbers of designs are taken under consideration for the available space to install the duct and the requirement. Airflow should be direct that conserves energy, space and cost altogether. To reduce noise, air velocity should be within permitted range. Quality and recommended materials should be used to construct the duct. These materials should be smoother. If you are changing the direction of the HVAC ducting then a sudden change in the direction should be avoided during commercial HVAC installation. There are various types of materials used to construct HVAC ductwork and the following are the most common. This is one of the most commonly used materials for ductwork that are low-cost, light-weight and durable. Sheet metals are available widely in various size and thickness that is fit for your requirement. These materials can be easily fabricated to construct HVAC ductwork. The smoother surface of these materials ensures low friction and low resistance to airflow. Fiber Glass Duct systems are little expensive however these are really required in the places where duct insulation to be done. Though these are expensive, at the same time it also reduces operational cost. A duct liner is a fiber-glass insulation used in lining the inner part of the rectangular ductwork. These are generally available in half or one-inch thickness. For thermal protection the broader one being used in the duct work that passes through the unconditioned area, while the half inch liner is frequently used for general insulation. Such a type of insulation is required to reduce noise generated by airflow or mechanical vibration of the air conditioning system. A supplementary adhesive material is also used in addition with these liners for insulation. As like as the duck liners these wrapping materials are also available in two sizes (i.e. thin size and thick size). Wrapping rolls are 4 to 6 ft wide. These wrapping rolls are used for blanket insulation. Duct wraps provide better protection for thermal hazards. These are used to wrap the outer portion of the ductwork and joints. In order to ensure the suitable dimension of the ductwork, a proper duct designing is required. Several designing patterns are used and mapped for the suitability of the location that is measured through rate of airflow, low-noise environment, cost-effective and so. Since several issues are there while designing a duct manually, a sophisticated software solution is also being used to find out the most accurate design.